Capt. Chadford C. Conway, whose wife Mrs. Helen Conway, lives at 3809 Hutchinson Road, Dunlinden Acres, recently received the commendation ribbon for meritorious service during a brief ceremony in Korea, where he is now logistics officer with the UN Command, Military Armistice Commission's logistics and liaison division. 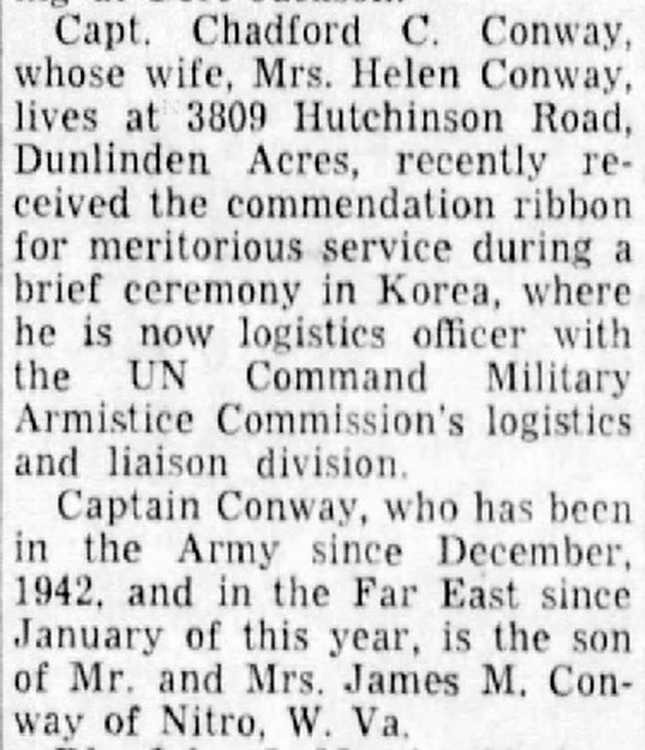 Captain Conway, who has been in the Army since December, 1942, and in the Far East since January of this year, is the son of Mr. and Mrs. James M. Conway, of Nitro, W. Va.
[The Morning News, Wilmington, DE, Thursday, May 24, 1956, Page 3] Mr. Chadford C. Conway, age 87 of 990 Hunting Avenue in Lincolnton, died on Tuesday, July 12, 2011. A graveside service will be held 2:00 pm on Saturday, July 16, 2011 at Forest Lawn Cemetery with Rev. Charles Ingle officiating. The family will greet friends after the service at graveside. Mr. Conway was born July 22, 1923 in Plymouth, WV to the late James M. and Goldie Smith Conway. He was a retired veteran of the US Army having served in the Korean War and World War II. He is survived by his wife, Helen Gilbert Conway of the home; three sons, Craig Conway of Lincolnton, Mark Conway of Columbia, SC, and Bruce Conway of Pauline, SC; one daughter, Sherry Reace of Gastonia; one sister, Audrey Smith of Charlottesville, VA; ten grandchildren; and eight great-grandchildren. 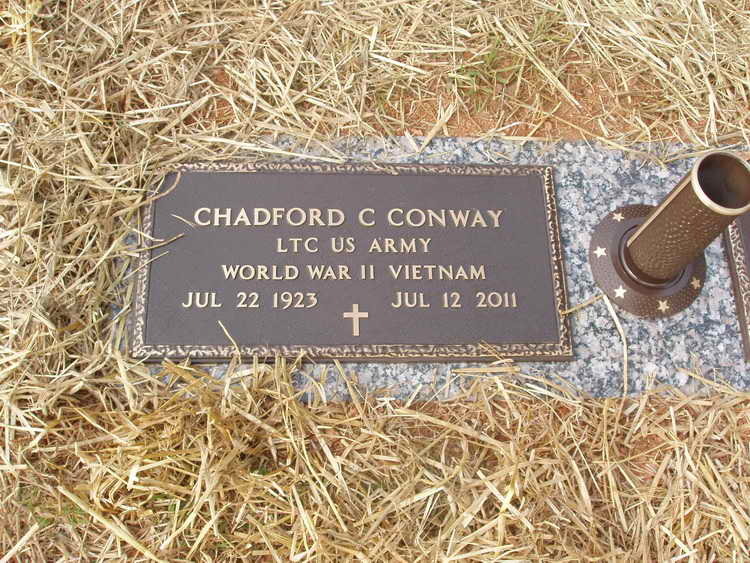 Grave marker for Chadford C. Conway in Forest Lawn Cemetery and Mausoleum, Lincolnton (Lincoln), North Carolina. Chadford registered for the draft ca. 1941 and enlisted in the Army ca. 11 August 1943. He was assigned to I Company, 508th PIR. Cpl Conway participated in the jump into Normandy on D-Day, 6 June 1944 and was awarded a Bronze Service Arrowhead device as well as the Combat Infantryman Badge. 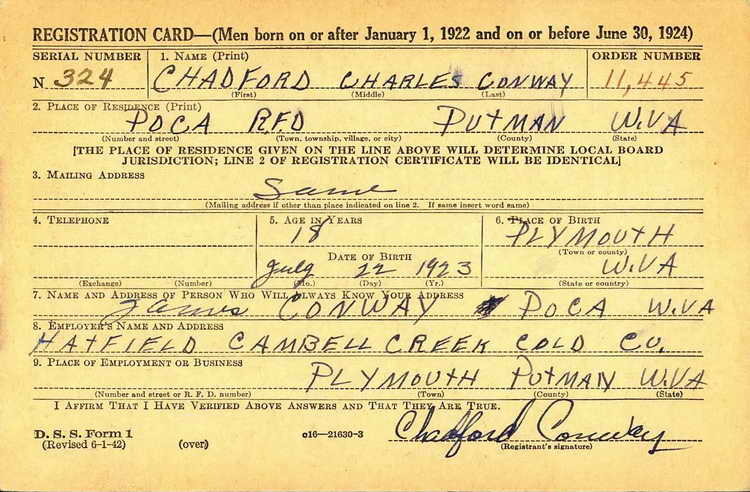 Following the war Cpl Conway re-enlisted in August 1946 and later earned a commission. He served in both Korea and Vietnam. and retired as a Lt. Colonel.